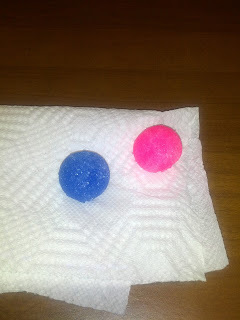 I am big on looking on pinterest and I keep pinning different ways to make homemade bouncy balls. 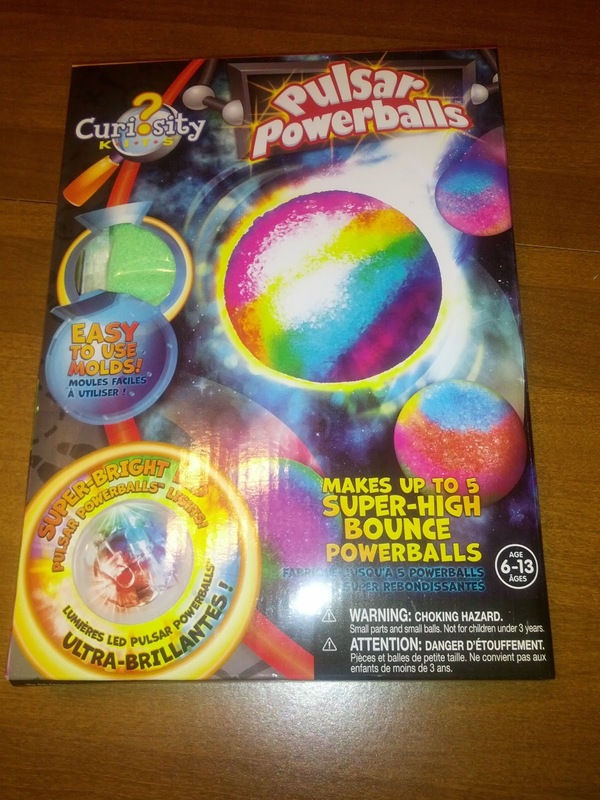 When The Orb Factory sent me their Pulsar Powerballs from the Curiosity collection, I was super excited. Not only did I collect those little bouncy balls when I was younger, but my girls have picked up where I left off and have continued to love the tiny little balls. This was the perfect activity to do during the recent snow storms we have had here in Michigan. The girls kept bugging me to either make them or to go play in the snow. So when it was too cold to go out we set out to make our Super Pulsar Powerballs. The girls were anxious while waiting for me to open the package and read the directions. It was wonderful that the kit comes with two of the Pulsar balls to go in the middle of the larger size balls, so each girl would get a ball that lights up. Much to our disappointment though, the large ball mold we were sent was two of the same parts and did not snap together like the smaller size ball. So we were unable to make the large size pulsar balls and only able to make two of the smaller balls. This was a very difficult product to work with for the girls, and even for me. I had cut the crystal package at the corner, as to help when it was poured into the mold. I allowed my oldest to pour her own at first which ended up with the crystals all over the floor and table. So I had to take that over and pour it in. 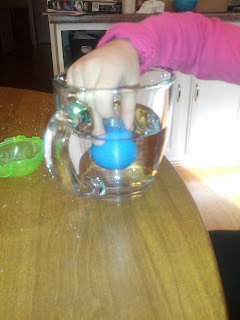 Then I had to help her hold the mold under the water. It wasn't supposed to be completely submerged for an entire minute which a little difficult for the kiddos. The larger size balls are supposed to be under water for even longer. 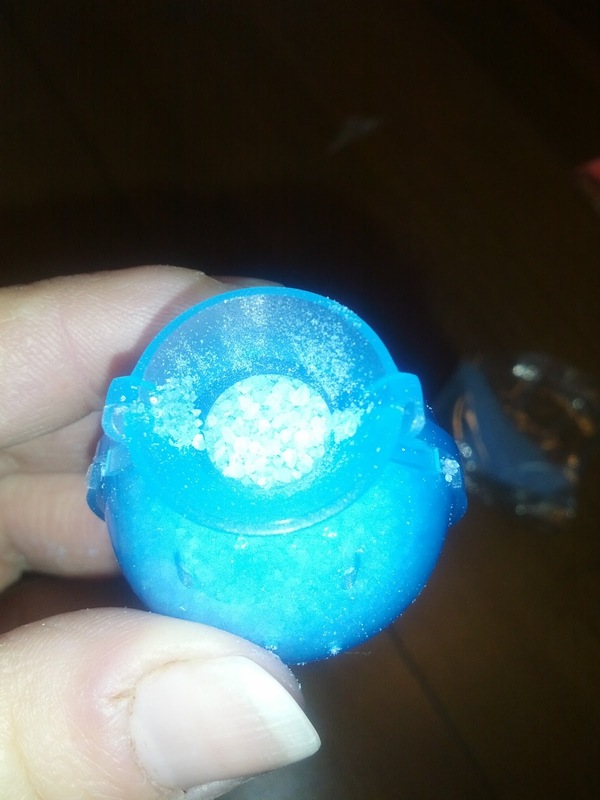 The mold split open while submerged and the ball shape was not perfectly round. My younger daughter had to have me make her entire ball for her. They then have to dry for about 5 minutes, which to a child seems like a lifetime. The girls had a blast playing with their super balls, until they ended up under the furniture. When we did find them a few days later they were really hard, and didn't bounce like when they were first made. Then I saw in the directions that for best keeping the balls should be kept in the refrigerator in a sealed plastic bag. This was a little disappointing only because the girls loved playing with them so much. Recommendation: This product would be good if I had received the correct parts to make the larger balls. I also wish the balls didn't have to be stored in the refrigerator to stay bouncy. 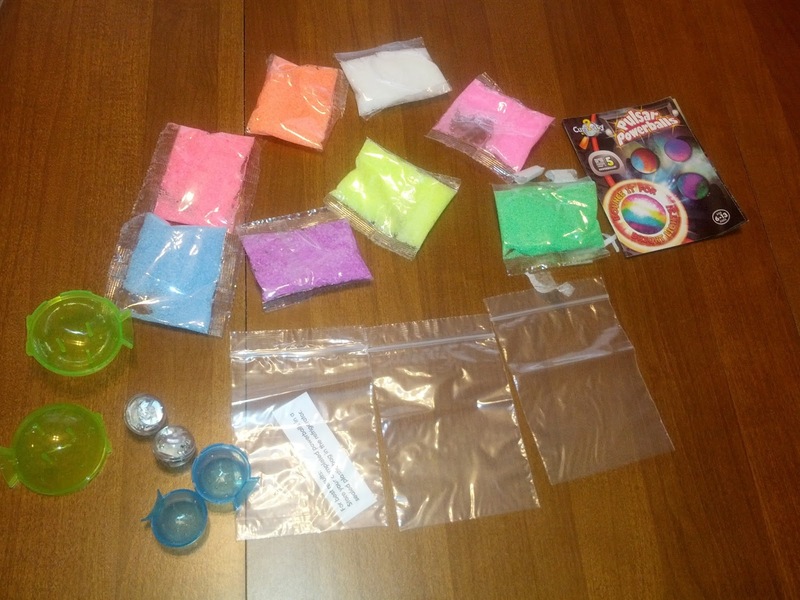 One kit is definitely worth it since you can make an abundance of small bouncy balls though and at such a decent price. Giveaway: The Orb Factory is going to give one of A Lucky Ladybug's lucky readers a Pulsar Powerballs of their own! The Pulsar Powerballs look like the best thing they offer! My son made something similar in Mad Science last year. He loved it! 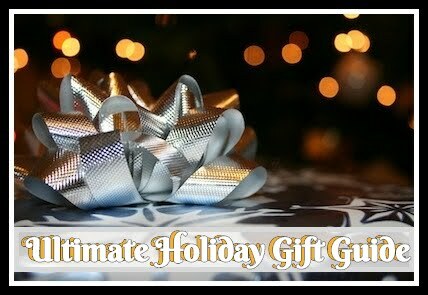 I would like to get the Ballerina Beauty Box for my daughter. it would be fun to do together & it would be a keepsake for her. I would like to try Fancy Nancy Stick 'n Style Build a Bow. I love the variety of different types of posts. Dislike the font. The Plush Craft Purr-Fect Pillow would be the 'purr-fect' gift for my granddaughter. We like doing crafts together and this would be great for both her age and her interests. This is such a cool site.I want all of it but if i had to choose i guess it would be sparkle ups. When you ask for us to "Pin something" or Pin a picture from a particular post, it would be helpful to have a Pinterest button ON THAT POST! 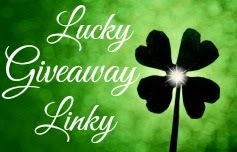 I follow you on Pinterest, & never could figure out how to pin something from tthis giveaway, since I also could NOT find it on your Pinterest pg... Thanks! I like the create a monster kit. I like the Magnetic Mosaics Jr.
My son would love the robots kit! The Sparkleups sound pretty neat. 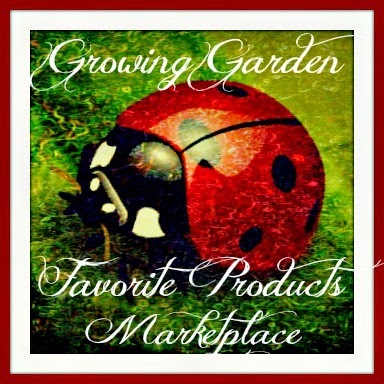 I'd like to see a section of your blog dedicated to printable coupons and savings. OH!! I know for a fact that my girls would love the monster kit!!! I'd like to try the Magnetic Mosaics!